Entering its second century, the Society of Motion Picture and Television Engineers (SMPTE) had adapted to an all-digital world. 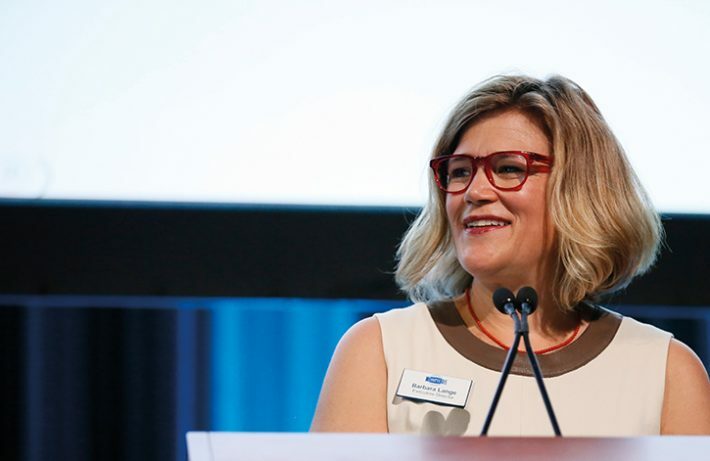 SMPTE executive director Barbara Lange is leading the industry’s most venerable standards body into the brave new world. FEED: How did you come to head up SMPTE? You originally trained as a scientist, right? Barbara Lange: Yes, I was a scientist, for a brief moment in my career. I had a degree in chemistry, but then I landed in academic publishing. As the internet became mainstream, academics and institutions started working with chemistry databases. It exciting times, – doing very primitive types of searching, before there was ever a notion of anything like Google. I ended up working for the IEEE (Institute of Electrical and Electronics Engineers), which is a large technical professional association – they claim they are the largest technical association in the world, with over 400,000 members – and they are a major academic publisher in engineering. I got involved in platform development and product managment, and helped migrate them from print to an electronic publishing operation. It was the late nineties and early two thousands, and it was all about getting rid of print and taking advantage of the capabilities of search. I became intimately involved with building IEEE’s digital library platform. Then in 2010 I got recruited to lead SMPTE. SMPTE was at a point where it really needed to operate as a business and take advantage of all the wonderful intellectual property it had. I’m now helping to keep it sustainable well into its next century. 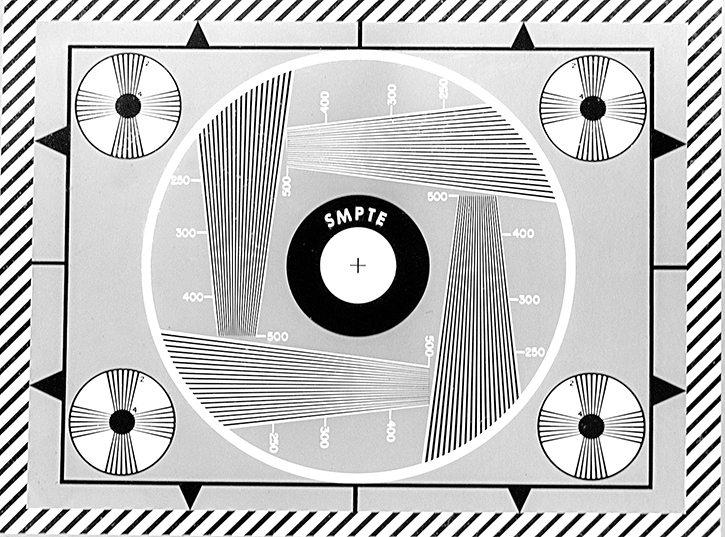 From The Very Start SMPTE film leaders and test patterns have provided a true north for countless film and TV productions. FEED: How have things changed at SMPTE since you came aboard? BL: We’ve done great things in the last eight years. We now have our own digital library. We’ve grown our visibility, both in terms of our membership and what people know about us. Our educational programming has advanced as well. There’s more work to do, but I’d like to think we’ve become more visible to the community – and all this while the industry has really grown and changed, and migrated headlong into the IP and streaming world. When I joined SMPTE I didn’t have an iPad. I barely had my first iPhone, and now we can hardly imagine living without those devices. FEED: What were some of the issues that needed to be upgraded when you arrived at SMPTE in 2010? 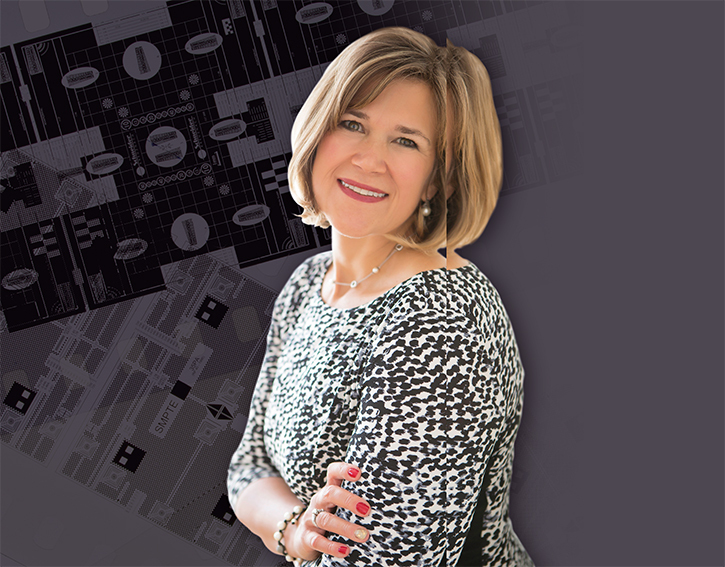 My first challenge was to level-set things and find out where our business opportunities were located. The first opportunity I saw was in leveraging our intellectual property, not only to generate revenue, but for our education materials. I also wanted to shore up the brand and get people excited about it and wanting to participate. 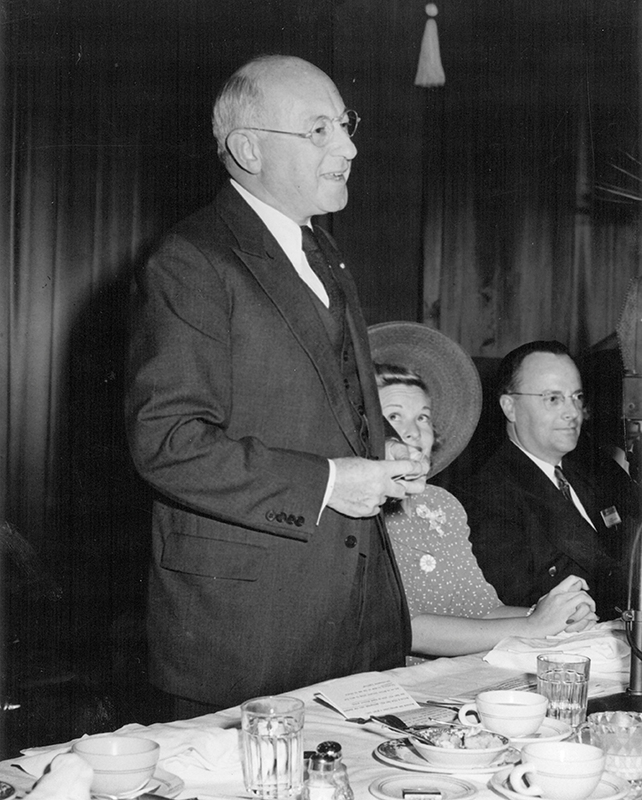 The Society wanted to be in a really strong position as it approached its centennial, and we are. And now we are looking at the next century and what it might mean. FEED: What types of SMPTE intellectual property did you make available? BL: The primary ones are our standards documents. We have close to a thousand if you go back to the very first ones that were developed back in 1917. We’d been kind of hiding it from the public. If you participated in the standards process, you knew all about them, but we hadn’t done a good job of sharing them. The same with our journal (SMPTE Motion Imaging Journal). We had a lot of very good journal content, with technical articles and historic materials by Walt Disney and Herbert Kalmus, and other extraordinary figures in the industry. Now we’ve been able to make that available to more than just the SMPTE community; we’ve digitised everything back to 1916 and it’s managed on a platform owned by the IEEE. The other intellectual property we’ve been developing is our educational programming, including webcasts and virtual courseware, where we can educate people about these new technologies. In addition to these central operations, our chapters around the world – what we call sections – are active in educating members at a local level. So in New York or Hollywood, or the UK or Hong Kong, they organise monthly meetings and have education. That content isn’t part of the digital library at the moment, but it’s part of the ecosystem of education that our members can enjoy. FEED: Has the increase in local sections helped “internationalise” the industry? BL: It’s a constant ambition to make sure that the industry knows that SMPTE is a global organisation. And we have been since the beginning. 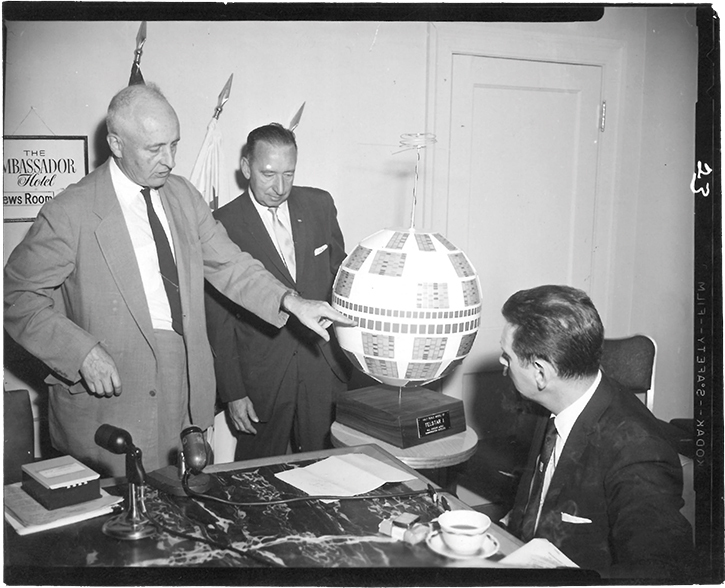 The first sections formed in the early part of SMPTE’s existence were in Canada, the UK, and even Australia. We’ve been a global organisation for almost the entirety of our existence. Back then it was motion pictures – broadcast and television didn’t come into play until the forties and fifties – and the technology was being developed in mancorners of the world. SMPTE was a community, even back then, that could tie people together. Even in the days of hand-written letters and mailing things through the post, it was a global organisation. We have about 27 sections around the world right now. Most of them are in North America. But outside of North America we have sections in the UK, Poland, Italy, Russia, India, Hong Kong, Australia, and we have a new section being revitalised in the Nordic area. We may be based in the United States, but our standards work is meant to address global issues, and our standards community is global in nature. One of our strategies has been developing toolsets to allow the different sections to communicate more easily with one another, so they could, for example, stream their monthly meetings and share a great visiting speaker with the rest of the world. We don’t yet have it functioning in a way that is broadcast style, but we’re looking at ways we can make that easier for people. Right now, the sections post their meetings on their own websites and we help them communicate back and forth. But in the future we hope to be able to connect the sections a lot more for collaboration with each other. 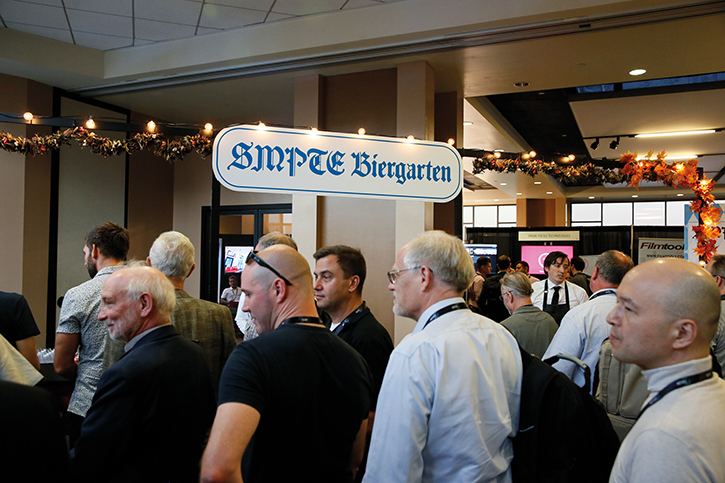 German Engineering SMPTE’s events – like last year’s Oktoberfest Reception – offer members a venue to exchange ideas and unwind. These technologists are queuing for beer. FEED: And you’ve also been cooperating with the HPA (Hollywood Professional Association) and helping them put on events? BL: We partnered with the HPA a couple of years ago. Our staffs are blended now and SMPTE run both organisations. 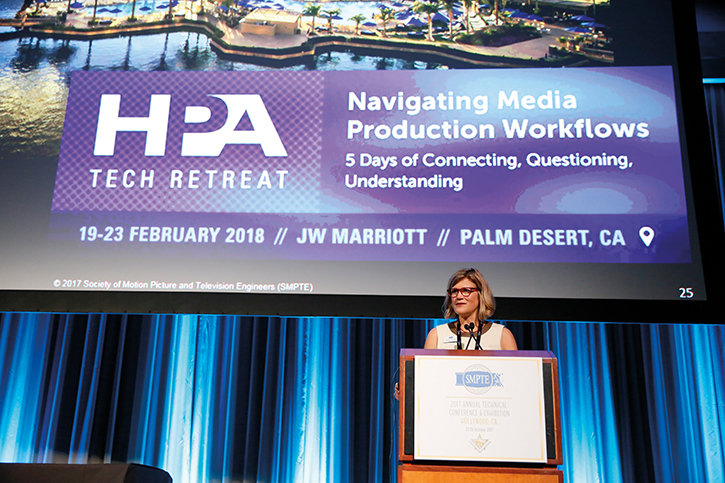 That’s been a happy relationship for the last few years and our goal is to blend the technical, SMPTE side with the more creative side of the HPA. It’s a much younger organisation than SMPTE and we really want to help them grow. HPA has a strong place in Hollywood and want to grow that internationally. FEED: We’re in a new, all-digital world, where technologies can evolve and change rapidly. How does a standards body, whose job traditionally is to provide stability, cope with that onslaught of change? What is SMPTE’s function in the new environment? BL: There are groups in the world who say, “We don’t really need standards and standards bodies anymore”. My opinion, and maybe I’m biased, is that in this time of rapid change, there’s a stronger need for a body that cares about due process and still develops a concensus-based standard and, most importantly, is there for the long haul. It’s easy for a group to get together and say, “We’re going to do a specification and we’ll all agree and get it done in six months”. But then what happens next? What happens when interest in that technology goes away? Or the people supporting that organisation lose interest? Or they go bankrupt or get acquired? I think organisations like SMPTE and other SDOs (standards developing organisations) are there to curate that technology, not just now but for the future. I think it’s vital that you have that reliability. We care so much about that due process and the curation of technology for the long haul. I think there are other organisations that are there to solve a quick problem – and that might be only for a couple of years – but then what happens? What happens when you build a process based on a technology that was short and sweet at the time, but isn’t curated for the long haul. What happens when you need to fix something? Do you start over? That’s when you need a standard that has longevity and reliability. I think that’s terribly important, especially in these times of change. And over the years we’ve seen that bear out, even from the very beginning. The reason SMPTE was formed was that when the motion picture industry was starting out there was a lot of chaos. There was a lot of competition around technology, and the industry came together and said, “Wait, this is crazy. We’re not doing ourselves any favours. We need a standard way to operate”. Standards work throughout any industry. Whether it’s finance, health care, consumer products, standards are the baseline that industry can grow on top of. But you’re right that due process takes time, and sometimes people don’t want to wait. We are using more and more software tools to help achieve greater efficiencies, whether they’re collaboration tools or software hubs, like GitHub. As the industry moves more toward software solutions, we’re becoming more a software-based standards body. FEED: Has the increasing importance of software in the industry altered or expanded the membership of SMPTE? BL: We have seen some churn, even in the last year or so. But we are seeing new members coming in – the Googles, the Amazons, the Netflixes – and they have embraced SMPTE, which we’re very happy about. We don’t have Facebook yet as a member, but as Facebook starts getting more into content creation, I think we’ll start seeing them look to us. We are actively looking to that world. A lot of those software people have never heard of SMPTE, believe it or not. Part of it is going to be an education exercise and talking to them about the benefits of joining an organisations like SMPTE. FEED: What kind of outreach has there been to that software and developer community? BL: One of the ways we’ve done it is with an event we just did in the Silicon Valley area called Entertainment Technology. 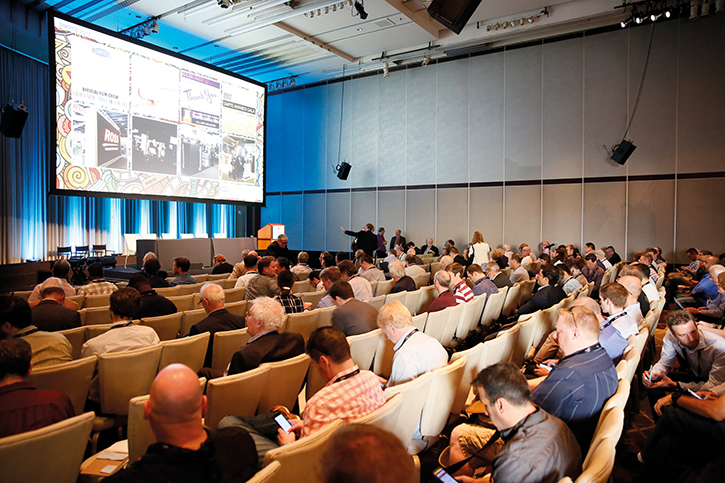 This year’s event was a two-day conference produced by the local SMPTE section. Google hosted it in a wonderful new facility and it was excellent. It’s an opportunity to be right in the middle of Silicon Valley, and the purpose of the conference has always been to try to marry the traditional Hollywood manner of making content with Silicon Valley types who may have never heard of SMPTE. This year there was a lot of discussion about immersive technology and how that changes storytelling, and there were a lot of technical discussions about how Google Chrome is accommodating media. And that’s a way we reach out to that community and make them aware of who we are. 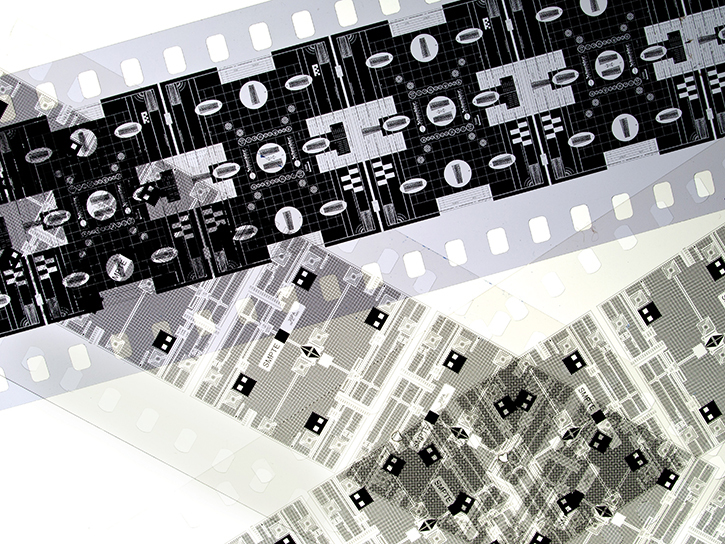 FEED: SMPTE has seen lots of technologies come and go over the years. Do you have a sense of the current period as being quite extraordinary? Or is the industry evolving in the same way it has always done? I don’t know if anyone can tell what it’s going to look like in three to five years time. But we believe that there is always going to be a need for standards. SMPTE is going to need to be adaptable – and sometimes standards aren’t so adaptable – so we’re in the process of developing a programme of technical specifications that build on standards, but allows flexibility. One of the things I’ve heard recently, which tells us how dramatic the changes could be, is Uber’s recent announcement that they might have flying cars in five years time. We don’t even have autonomous cars figured out yet, but they are thinking that in five years they’re going to do flying cars. And it might happen. Things like that will change everything. If you’re sitting in an autonomous car, what will you do while you’re sitting there? You’ll work or you’ll be entertained, and that’s going to include motion pictures. And what about immersive technologies in that environment? We can’t even get our heads around that – we’re still struggling with the idea of VR. So I think it will be even more rapid than we can even imagine. And the best we can do is keep our eyes open and be aware of these big innovators and disruptors. They don’t have a connection with SMPTE by any stretch right now, but they ultimately may. In fact, our annual conference in October will be about entertainment in the car, with a key speaker from Intel. For us, it’s about being mindful and paying attention to the outside world and not being so motion picture and television focused. That will always be there, but there’s more out there. We just need to have our eyes wide open. This article originally appeared in the July 2018 issue of FEED magazine.